A method and apparatus for including in a processor instructions for performing multiply-add operations on packed data. In one embodiment, a processor is coupled to a memory. The memory has stored therein a first packed data and a second packed data. The processor performs operations on data elements in said first packed data and said second packed data to generate a third packed data in response to receiving an instruction. At least two of the data elements in this third packed data storing the result of performing multiply-add operations on data elements in the first and second packed data. Ser. No. ______, titled “A Method and Apparatus for Performing Multiply-Subtract Operations on Packed Data,” filed , by Alexander D. Peleg, Millind Mittal, Larry M. Mennemeier, Benny Eitan, Andrew F. Glew, Carole Dulong, Eiichi Kowashi, and Wolf Witt. One such prior art DSP includes a multiply accumulate instruction that adds to an accumulation value the results of multiplying together two values. (see Kawakami, Yuichi, et al., “A Single-Chip Digital Signal Processor for Voiceband Applications”, IEEE International Solid-State Circuits Conference, 1980, pp. 40-41). An example of the multiply accumulate operation for this DSP is shown below in Table 1, where the instruction is performed on the data values A 1 and B1 accessed as Source1 and Source2, respectively. Another prior art DSP includes a multiply accumulate instruction that operates on two sets of two values and an accumulation value (See “Digital Signal Processor with Parallel Multipliers”, U.S. Pat. No. 4,771,470—referred to herein as the “Ando et al.” reference). An example of the multiply accumulate instruction for this DSP is shown below in Table 2, where the instruction is performed on the data values A 1, A2, B1 and B2 accessed as Source 1-4, repectively. FIG. 5 a illustrates in-register packed data representations according to one embodiment of the invention. FIG. 5 b illustrates in-register packed data representations according to one embodiment of the invention. FIG. 5 c illustrates in-register packed data representations according to one embodiment of the invention. FIG. 6 a illustrates a control signal format for indicating the use of packed data according to one embodiment of the invention. FIG. 6 b illustrates a second control signal format for indicating the use of packed data according to one embodiment of the invention. defines a subfield of binary number. For example, bit six through bit zero of the byte 00111010 2 (shown in base two) represent the subfield 1110102. The ‘2’ following a binary number indicates base 2. Therefore, 10002 equals 810, while F16 equals 1510. FIG. 1 illustrates an exemplary computer system  100 according to one embodiment of the invention. Computer system 100 includes a bus 101, or other communications hardware and software, for communicating information, and a processor 109 coupled with bus 101 for processing information. Processor 109 represents a central processing unit of any type of architecture, including a CISC or RISC type architecture. Computer system 100 further includes a random access memory (RAM) or other dynamic storage device (referred to as main memory 104), coupled to bus 101 for storing information and instructions to be executed by processor 109. Main memory 104 also may be used for storing temporary variables or other intermediate information during execution of instructions by processor 109. Computer system 100 also includes a read only memory (ROM) 106, and/or other static storage device, coupled to bus 101 for storing static information and instructions for processor 109. Data storage device 107 is coupled to bus 101 for storing information and instructions. FIG. 1 also illustrates that processor 109 includes an execution unit 130, a register file 150, a cache 160, a decoder 165, and an internal bus 170. Of course, processor 109 contains additional circuitry which is not necessary to understanding the invention. Execution unit  130 is used for executing instructions received by processor 109. In addition to recognizing instructions typically implemented in general purpose processors, execution unit 130 recognizes instructions in packed instruction set 140 for performing operations on packed data formats. Packed instruction set 140 includes instructions for supporting multiply-add and/or multiply-subtract operations. In addition, packed instruction set 140 may also include instructions for supporting a pack operation, an unpack operation, a packed add operation, a packed subtract operation, a packed multiply operation, a packed shift operation, a packed compare operation, a population count operation, and a set of packed logical operations (including packed AND, packed ANDNOT, packed OR, and packed XOR) as described in “A Set of Instructions for Operating on Packed Data ,” filed on ______, Ser. No. ______. Execution unit  130 is coupled to register file 150 by internal bus 170. Register file 150 represents a storage area on processor 109 for storing information, including data. It is understood that one aspect of the invention is the described instruction set for operating on packed data. According to this aspect of the invention, the storage area used for storing the packed data is not critical. However, one embodiment of the register file 150 is later described with reference to FIG. 2. Execution unit 130 is coupled to cache 160 and decoder 165. Cache 160 is used to cache data and/or control signals from, for example, main memory 104. Decoder 165 is used for decoding instructions received by processor 109 into control signals and/or microcode entry points. In response to these control signals and/or microcode entry points, execution unit 130 performs the appropriate operations. For example, if an add instruction is received, decoder 165 causes execution unit 130 to perform the required addition; if a subtract instruction is received, decoder 165 causes execution unit 130 to perform the required subtraction; etc. Decoder 165 may be implemented using any number of different mechanisms (e.g., a look-up table, a hardware implementation, a PLA, etc.). Thus, while the execution of the various instructions by the decoder and execution unit is represented by a series of if/then statements, it is understood that the execution of an instruction does not require a serial processing of these if/then statements. Rather, any mechanism for logically performing this if/then processing is considered to be within the scope of the invention. FIG. 1 additionally shows a data storage device  107, such as a magnetic disk or optical disk, and its corresponding disk drive, can be coupled to computer system 100. Computer system 100 can also be coupled via bus 101 to a display device 121 for displaying information to a computer user. Display device 121 can include a frame buffer, specialized graphics rendering devices, a cathode ray tube (CRT), and/or a flat panel display. An alphanumeric input device 122, including alphanumeric and other keys, is typically coupled to bus 101 for communicating information and command selections to processor 109. Another type of user input device is cursor control 123, such as a mouse, a trackball, a pen, a touch screen, or cursor direction keys for communicating direction information and command selections to processor 109, and for controlling cursor movement on display device 121. This input device typically has two degrees of freedom in two axes, a first axis (e.g., x) and a second axis (e.g., y), which allows the device to specify positions in a plane. However, this invention should not be limited to input devices with only two degrees of freedom. Another device which may be coupled to bus  101 is a hard copy device 124 which may be used for printing instructions, data, or other information on a medium such as paper, film, or similar types of media. Additionally, computer system 100 can be coupled to a device for sound recording, and/or playback 125, such as an audio digitizer coupled to a microphone for recording information. Further, the device may include a speaker which is coupled to a digital to analog (D/A) converter for playing back the digitized sounds. Also, computer system  100 can be a terminal in a computer network (e.g., a LAN). Computer system 100 would then be a computer subsystem of a computer network. Computer system 100 optionally includes video digitizing device 126. Video digitizing device 126 can be used to capture video images that can be transmitted to others on the computer network. In one embodiment, the processor  109 additionally supports an instruction set which is compatible with the x86 instruction set used by existing processors (such as the Pentium® processor) manufactured by Intel Corporation of Santa Clara, Calif. Thus, in one embodiment, processor 109 supports all the operations supported in the IA™—Intel Architecture, as defined by Intel Corporation of Santa Clara, Calif. (see Microprocessors, Intel Data Books volume 1 and volume 2, 1992 and 1993, available from Intel of Santa Clara, Calif.). As a result, processor 109 can support existing x86 operations in addition to the operations of the invention. While the invention is described as being incorporated into an x86 based instruction set, alternative embodiments could incorporate the invention into other instruction sets. For example, the invention could be incorporated into a 64-bit processor using a new instruction set. FIG. 2 illustrates the register file of the processor according to one embodiment of the invention. The register file  150 is used for storing information, including control/status information, integer data, floating point data, and packed data. In the embodiment shown in FIG. 2, the register file 150 includes integer registers 201, registers 209, status registers 208, and instruction pointer register 211. Status registers 208 indicate the status of processor 109. Instruction pointer register 211 stores the address of the next instruction to be executed. Integer registers 201, registers 209, status registers 208, and instruction pointer register 21 1 are all coupled to internal bus 170. Any additional registers would also be coupled to internal bus 170. In one embodiment, the registers  209 are used for both packed data and floating point data. In one such embodiment, the processor 109, at any given time, must treat the registers 209 as being either stack referenced floating point registers or non-stack referenced packed data registers. In this embodiment, a mechanism is included to allow the processor 109 to switch between operating on registers 209 as stack referenced floating point registers and non-stack referenced packed data registers. In another such embodiment, the processor 109 may simultaneously operate on registers 209 as non-stack referenced floating point and packed data registers. As another example, in another embodiment, these same registers may be used for storing integer data. The various sets of registers (e.g., the integer registers  201, the registers 209) may be implemented to include different numbers of registers and/or to different size registers. For example, in one embodiment, the integer registers 201 are implemented to store thirty-two bits, while the registers 209 are implemented to store eighty bits (all eighty bits are used for storing floating point data, while only sixty-four are used for packed data). In addition, registers 209 contains eight registers, R0 212 a through R7 212 h. R1 212 a, R2 212 b and R3 212 c are examples of individual registers in registers 209. Thirty-two bits of a register in registers 209 can be moved into an integer register in integer registers 201. Similarly, a value in an integer register can be moved into thirty-two bits of a register in registers 209. In another embodiment, the integer registers 201 each contain 64 bits, and 64 bits of data may be moved between the integer register 201 and the registers 209. FIG. 3 is a flow diagram illustrating the general steps are used by the processor to manipulate data according to one embodiment of the invention. That is, FIG. 3 illustrates the steps followed by processor  109 while performing an operation on packed data, performing an operation on unpacked data, or performing some other operation. For example, such operations include a load operation to load a register in register file 150 with data from cache 160, main memory 104, read only memory (ROM) 106, or data storage device 107. At step  301, the decoder 165 receives a control signal from either the cache 160 or bus 101. Decoder 165 decodes the control signal to determine the operations to be performed. At step  302, Decoder 165 accesses the register file 150, or a location in memory. Registers in the register file 150, or memory locations in the memory, are accessed depending on the register address specified in the control signal. For example, for an operation on packed data, the control signal can include SRC1, SRC2 and DEST register addresses. SRC1 is the address of the first source register. SRC2 is the address of the second source register. In some cases, the SRC2 address is optional as not all operations require two source addresses. If the SRC2 address is not required for an operation, then only the SRC1 address is used. DEST is the address of the destination register where the result data is stored. In one embodiment, SRC1 or SRC2 is also used as DEST. SRC1, SRC2 and DEST are described more fully in relation to FIG. 6a and FIG. 6b. The data stored in the corresponding registers is referred to as Source 1, Source2, and Result respectively. Each of these data is sixty-four bits in length. In another embodiment of the invention, any one, or all, of SRC1, SRC2 and DEST, can define a memory location in the addressable memory space of processor  109. For example, SRC1 may identify a memory location in main memory 104, while SRC2 identifies a first register in integer registers 201 and DEST identifies a second register in registers 209. For simplicity of the description herein, the invention will be described in relation to accessing the register file 150. However, these accesses could be made to memory instead. At step  303, execution unit 130 is enabled to perform the operation on the accessed data. At step 304, the result is stored back into register file 150 according to requirements of the control signal. FIG. 4 illustrates packed data-types according to one embodiment of the invention. Three packed data formats are illustrated; packed byte  401, packed word 402, and packed doubleword 403. Packed byte, in one embodiment of the invention, is sixty-four bits long containing eight data elements. Each data element is one byte long. Generally, a data element is an individual piece of data that is stored in a single register (or memory location) with other data elements of the same length. In one embodiment of the invention, the number of data elements stored in a register is sixty-four bits divided by the length in bits of a data element. Packed word  402 is sixty-four bits long and contains four word 402 data elements. Each word 402 data element contains sixteen bits of information. Packed doubleword 403 is sixty-four bits long and contains two doubleword 403 data elements. Each doubleword 403 data element contains thirty-two bits of information. FIGS. 5 a through 5 c illustrate the in-register packed data storage representation according to one embodiment of the invention. Unsigned packed byte in-register representation 510 illustrates the storage of an unsigned packed byte 401 in one of the registers R0 212 a through R7 212h. Information for each byte data element is stored in bit seven through bit zero for byte zero, bit fifteen through bit eight for byte one, bit twenty-three through bit sixteen for byte two, bit thirty-one through bit twenty-four for byte three, bit thirty-nine through bit thirty-two for byte four, bit forty-seven through bit forty for byte five, bit fifty-five through bit forty-eight for byte six and bit sixty-three through bit fifty-six for byte seven. Thus, all available bits are used in the register. This storage arrangement increases the storage efficiency of the processor. As well, with eight data elements accessed, one operation can now be performed on eight data elements simultaneously. Signed packed byte in-register representation 511 illustrates the storage of a signed packed byte 401. Note that the eighth bit of every byte data element is the sign indicator. Unsigned packed word in-register representation  512 illustrates how word three through word zero are stored in one register of registers 209. Bit fifteen through bit zero contain the data element information for word zero, bit thirty-one through bit sixteen contain the information for data element word one, bit forty-seven through bit thirty-two contain the information for data element word two and bit sixty-three through bit forty-eight contain the information for data element word three. Signed packed word in-register representation 513 is similar to the unsigned packed word in-register representation 512. Note that the sixteenth bit of each word data element is the sign indicator. Unsigned packed doubleword in-register representation  514 shows how registers 209 store two doubleword data elements. Doubleword zero is stored in bit thirty-one through bit zero of the register. Doubleword one is stored in bit sixty-three through bit thirty-two of the register. Signed packed doubleword in-register representation 515 is similar to unsigned packed doubleword in-register representation 514. Note that the necessary sign bit is the thirty-second bit of the doubleword data element. As mentioned previously, registers  209 may be used for both packed data and floating point data. In this embodiment of the invention, the individual programming processor 109 may be required to track whether an addressed register, Ro 212 a for example, is storing packed data or floating point data. In an alternative embodiment, processor 109 could track the type of data stored in individual registers of registers 209. This alternative embodiment could then generate errors if, for example, a packed addition operation were attempted on floating point data. The following describes one embodiment of the control signal formats used by processor  109 to manipulate packed data. In one embodiment of the invention, control signals are represented as thirty-two bits. Decoder 165 may receive the control signal from bus 101. In another embodiment, decoder 165 can also receive such control signals from cache 160. FIG. 6a illustrates a control signal format for indicating the use of packed data according to one embodiment of the invention. Operation field OP 601, bit thirty-one through bit twenty-six, provides information about the operation to be performed by processor 109; for example, packed addition, packed subtraction, etc. SRC1 602, bit twenty-five through twenty, provides the source register address of a register in registers 209. This source register contains the first packed data, Source1, to be used in the execution of the control signal. Similarly, SRC2 603, bit nineteen through bit fourteen, contains the address of a register in registers 209. This second source register contains the packed data, Source2, to be used during execution of the operation. DEST 605, bit five through bit zero, contains the address of a register in registers 209. This destination register will store the result packed data, Result, of the packed data operation. Control bits SZ  610, bit twelve and bit thirteen, indicates the length of the data elements in the first and second packed data source registers. If SZ 610 equals 012, then the packed data is formatted as packed byte 401. If SZ 610 equals 102, then the packed data is formatted as packed word 402. SZ 610 equaling 002 or 112 is reserved, however, in another embodiment, one of these values could be used to indicate packed doubleword 403. Control bit T 611, bit eleven, indicates whether the operation is to be carried out with saturate mode. If T 611 equals one, then a saturating operation is performed. If T 611 equals zero, then a non-saturating operation is performed. Saturating operations will be described later. Control bit S  612, bit ten, indicates the use of a signed operation. If S 612 equals one, then a signed operation is performed. If S 612 equals zero, then an unsigned operation is performed. FIG. 6 b illustrates a second control signal format for indicating the use of packed data according to one embodiment of the invention. This format corresponds with the general integer opcode format described in the “Pentium Processor Family User's Manual,” available from Intel Corporation, Literature Sales, P.O. Box 7641, Mt. prospect, Ill., 60056-7641. Note that OP 601, SZ 610, T 611, and S 612 are all combined into one large field. For some control signals, bits three through five are SRC1 602. In one embodiment, where there is a SRC1 602 address, then bits three through five also correspond to DEST 605. In an alternate embodiment, where there is a SRC2 603 address, then bits zero through two also correspond to DEST 605. For other control signals, like a packed shift immediate operation, bits three through five represent an extension to the opcode field. In one embodiment, this extension allows a programmer to include an immediate value with the control signal, such as a shift count value. In one embodiment, the immediate value follows the control signal. This is described in more detail in the “Pentium Processor Family User's Manual,” in appendix F, pages F-1 through F-3. Bits zero through two represent SRC2 603. This general format allows register to register, memory to register, register by memory, register by register, register by immediate, register to memory addressing. Also, in one embodiment, this general format can support integer register to register, and register to integer register addressing. As mentioned previously, T  611 indicates whether operations optionally saturate. Where the result of an operation, with saturate enabled, overflows or underflows the range of the data, the result will be clamped. Clamping means setting the result to a maximum or minimum value should a result exceed the range's maximum or minimum value. In the case of underflow, saturation clamps the result to the lowest value in the range and in the case of overflow, to the highest value. The allowable range for each data format is shown in Table 5. At step  701, decoder 165 decodes the control signal received by processor 109. Thus, decoder 165 decodes: the operation code for a multiply-add instruction or a multiply-subtract instruction. At step 702, via internal bus 170, decoder 165 accesses registers 209 in register file 150 given the SRC1 602 and SRC2 603 addresses. Registers 209 provide execution unit 130 with the packed data stored in the SRC1 602 register (Source1), and the packed data stored in SRC2 603 register (Source2). That is, registers 209 communicate the packed data to execution unit 130 via internal bus 170. At step  703, decoder 165 enables execution unit 130 to perform the instruction. If the instruction is a multiply-add instruction, flow passes to step 714. However, if the instruction is a multiply-subtract instruction, flow passes to step 715. In step  714, the following is performed. Source1 bits fifteen through zero are multiplied by Source2 bits fifteen through zero generating a first 32-bit intermediate result (Intermediate Result 1). Source1 bits thirty-one through sixteen are multiplied by Source2 bits thirty-one through sixteen generating a second 32-bit intermediate result (Intermediate Result 2). Source1 bits forty-seven through thirty-two are multiplied by Source2 bits forty-seven through thirty-two generating a third 32-bit intermediate result (Intermediate Result 3). Source1 bits sixty-three through forty-eight are multiplied by Source2 bits sixty-three through forty-eight generating a fourth 32-bit intermediate result (Intermediate Result 4). Intermediate Result 1 is added to Intermediate Result 2 generating Result bits thirty-one through 0, and Intermediate Result 3 is added to Intermediate Result 4 generating Result bits sixty-three through thirty-two. Step 715 is the same as step 714, with the exception that Intermediate Result 1 Intermediate Result 2 are subtracted to generate bits thirty-one through 0 of the Result, and Intermediate Result 3 and Intermediate Result 4 are subtracted to generate bits sixty-three through thirty-two of the Result. At step  720, the Result is stored in the DEST register. FIG. 8 illustrates a circuit for performing multiply-add and/or multiply-subtract operations on packed data according to one embodiment of the invention. Operation control  800 processes the control signal for the multiply-add and multiply-subtract instructions. Operation control 800 outputs signals on Enable 880 to control Packed multiply-adder/subtractor 801. Packed multiply-adder/subtractor  801 has the following inputs: Source1 [63:0] 831, Source2[63:0] 833, and Enable 880. Packed multiply-adder/subtractor 801 includes four 16×16 multiplier circuits: 16×16 multiplier A 810, 16×16 multiplier B 811, 16×16 multiplier C 812 and 16×16 multiplier D 813. 16×16 multiplier A 810 has as inputs Source1[15:0] and Source2[15:0]. 16×16 multiplier B 811 has as inputs Source1 [31:16] and Source2[31:16]. 16×16 multiplier C 812 has as inputs Source1[47:32] and Source2[47:32]. 16×16 multiplier D 813 has as inputs Source1[63:48] and Source2[63:48]. The 32-bit intermediate results generated by 16×16 multiplier A 810 and 16×16 multiplier B 811 are received by adder/subtractor 1350, while the 32-bit intermediate results generated by 16×16 multiplier C 812 and 16×16 multiplier D 813 are received by adder/subtractor 851. Based on whether the current instruction is a multiply/add or multiply/subtract instruction, adder/subtractor  850 and adder/subtractor 851 add or subtract their respective 32-bit inputs. The output of adder/subtractor 850 (i.e., Result bits 31 through zero of the Result) and the output of adder/subtractor 851 (i.e., bits 63 through 32 of the Result) are combined into the 64-bit Result and communicated to Result Register 871. In one embodiment, each of adder/subtractor  851 and adder/subtractor 850 are composed of four 8-bit adders/subtractors with the appropriate propagation delays. However, alternative embodiments could implement adder/subtractor 851 and adder/subtractor 850 in any number of ways (e.g., two 32-bit adders/subtractors). The disclosed multiply-add instructions can also be used to multiply and accumulate values. For example, two sets of four data elements (A 1-4 and B1-4) may be multiplied and accumulated as shown below in Table 7. In one embodiment, each of the instructions shown in Table 7 is implemented to complete each clock cycle. a processor coupled to said memory to receive said first packed data and said second packed data, said processor performing operations on data elements in said first packed data and said second packed data to generate a plurality of data elements in a third packed data in response to receiving an instruction, at least two of said plurality of data elements in said third packed data storing the result of multiply-add operations. (said third data element multiplied by said seventh data element) added to (said fourth data element multiplied by said eighth data element). said ninth data element and said tenth data element each comprising a second predetermined number of bits, said second predetermined number of bits being greater than said first predetermined number of bits. 4. 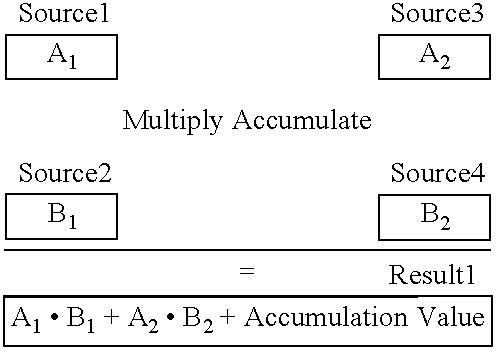 The apparatus of claim 1, wherein said multiply-add operation is performed with saturation. a circuit coupled to said first storage area, said circuit multiplying a value A by a value B to generate a first intermediate result, multiplying a value C by a value D to generate a second intermediate result, multiplying a value E by a value F to generate a third intermediate result, multiplying a value G by a value H to generate a fourth intermediate result, adding said first intermediate result to said second intermediate result to generate a value I, adding said third intermediate result to said fourth intermediate result to generate a value J, and storing said value I and said value J in said first storage area as elements of a first packed data in response to an enable signal. a third storage area coupled to said circuit, said third storage for storing said value E, said value F, said value G, and said value H as data elements of a third packed data. 7. The apparatus of claim 5, said value I and said value J providing a higher precision than at least one of said value A, said value B, said value C, said value D, said value E, said value F, said value G, and said value H.
a multiply-add instruction for operating on a first packed data and a second packed data, said first packed data containing at least data elements A, B, C, and D each including a predetermined number of bits, said second packed data containing at least data elements E, F, G, and H each including said predetermined number of bits, said processor generating a third packed data containing at least data elements I and J in response to receiving said multiply-add instruction, said data element I equal to (A×E)+(B×F), said data element J equal to (C×G)+(D×H). 9. The computer system of claim 8, said processor further including a first register, said processor, in addition to generating said third packed data, also storing said third packed data in said first register in response to receiving said multiply-add instruction. a second register having stored therein said second packed data. 11. The computer system of claim 8, said storage area further having stored therein said first packed data and said second packed data. 12. The computer system of claim 8, said data elements I and J providing a higher precision than at least one of said data elements A, B, C, D, E, F, G, and H.
13. The computer system of claim 8, said data elements I and J including two times said predetermined number of bits. 14. The computer system of claim 8, said data elements A, B, C, D, E, F, G, H, I and J are either unsigned or signed data elements. a third storage area coupled to said first adder and said second adder, said third storage area having at least a first field and a second field, said first field for storing the output of said first adder as a first data element of a third packed data, said second field for storing the output of said second adder as a second data element of said third packed data. a storage means for storing said value I in said first field and said value J in said second field as a first packed data. a storage means for storing said result data elements as a third packed data in said memory. 18. The apparatus of claim 17, wherein said memory includes a register for storing said third packed data. 19. The apparatus of claim 17, wherein said first packed data and said second packed data each contain at least four initial data elements, and wherein each of said sets contain at least two intermediate data elements. 20. The apparatus of claim 17, wherein said arithmetic operations are performed with saturation. 21. The apparatus of claim 17, wherein said initial data elements, said intermediate data elements, and said result data elements are each either signed or unsigned values. 22. The apparatus of claim 17, wherein said intermediate data elements and said result data elements contain twice as many bits as said initial data elements. a processor coupled to said memory to receive said first packed data and said second packed data, said circuit storing in a third storage area a plurality of data element as a third packed data in response to receiving an instruction, each of said plurality of data elements storing the dot product of one of said first plurality of sets of data elements in said first packed data and said corresponding set of data elements in said second packed data. B7) storing said first packed data in a first storage area. storing said third packed data in a first storage area. storing said plurality of result data elements as a third packed data in a memory.